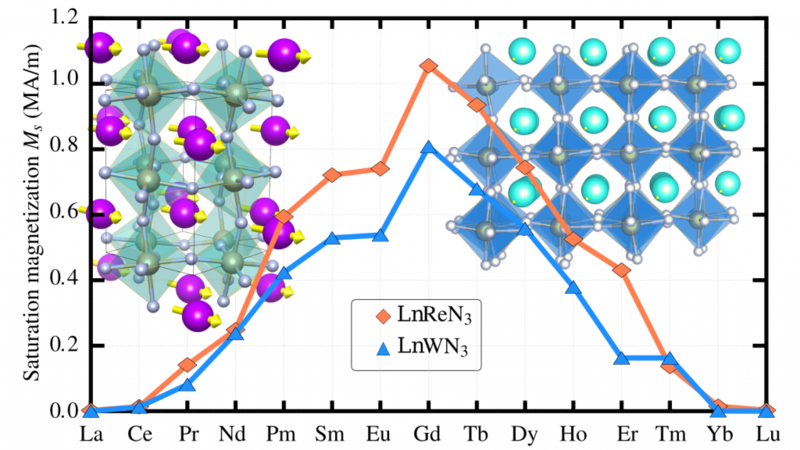 In our most recent work, we propose nitrides in perovskite type structures with magnetic rare-earth metals. These materials appear to be thermodynamically stable and, in spite of possessing different crystal structures and different atomic environments, they retain the magnetic moment of the corresponding elemental rare-earth metal. We find both magnetic metals and semiconductors, with a wide range of magnetic moments and some systems posses record high magnetic anisotropy energies. Further tuning of the electronic and magnetic properties can also be expected by doping with other rare-earths or by creating solid solutions. The synthesis of these exotic materials with unusual compositions would not only extend the accepted stability domain of perovskites, but also open the way for a series of applications enabled by their rich physics. This work is now published in the new open access Journal of Physics: Materials (JPhys Materials, from IOP Science).